Bleeding from one or both nostrils is known as epistaxis or nosebleed. Bleeding usually occurs in one nostril. Nosebleeds can be due to local or systemic factors. However, significant cases of nosebleeds occur with no obvious cause. Diagnosis of epistaxis is made after a thorough medical history for previous bleeding, high blood pressure, liver diseases, use of anticoagulants, nasal trauma, family history of bleeding etc. Stay on a soft, cool diet. Do not drink hot liquids for at least 24 hours following a nosebleed episode. Do not take any blood thinning medications like aspirin during a nosebleed episode. Keep the lining of the nose moist. 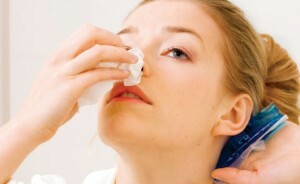 Gently apply a light coating of petroleum jelly inside the nose with a cotton swab twice a day. Nasal saline spray can help prevent nosebleeds, especially during the winter months. Many a times Epistaxis is idiopathic (without any physical cause in the body ) . Children has the tendency to nose bleed without reason . Homoeopathy has good medicines for Epistaxis whether it is idiopathic or due to above mentioned local and systematic causes. According to the accompanied symptom the doctor will come to the right remedy. The most important medicines are: Aconite, Ammonium Carb, Arnica, Calcarea phos, Phosphorous, Crotalushoridus, Rhustox, Sulphur, tuberculinum, Sabina, Nitric Acid.